Debra was ranked 697 in 1984 list of US boys name and dropped by 3.11% from its previous ranking of 676 in 1983. 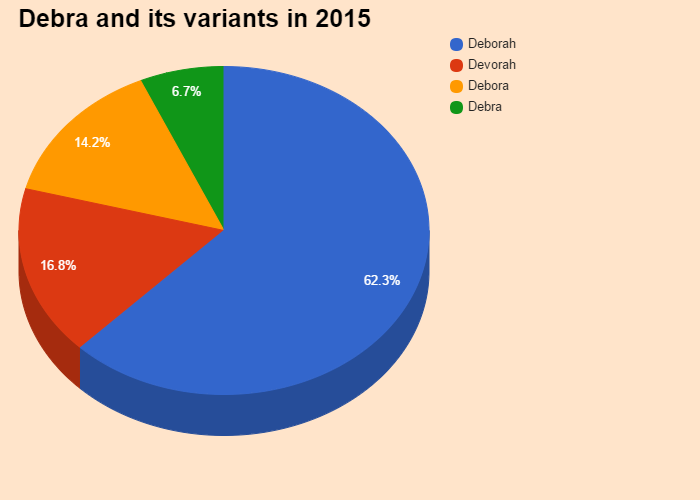 Debra was ranked 932 in 2015 list of US girls name and dropped by 3.10% from its previous ranking of 904 in 2014. Anglo-Saxon form of Deborah. Comes from the Hebrew "déborah" means "bee" If Day 21 September.. Debra are sincere and deeply hate lying. Straight, serious,Debrasometimes lack a bit of humor. Debra are courageous, hardworking and recovering constantly in question. Still dissatisfied,Debraseek to do better. Their charm, femininity and their actual sensitivity makes them endearing and faithful women. Debra is a rare first name for a girl in England & Wales which is a rare name since 1996 and ranked 4684 in 2014. Only 78 people have Debra as their first name. Debra is a very very popular first name for a girl in United States which is popular since 1946 and ranked 932 (0.000934% bearer) in 2015 in US. Around 551372 people wear Debra as their first name. Debra is a rare first name for a boy in United States which is a rare name since 1914 and ranked 932 (0.000934% bearer) in 2015 in US. Only 551372 people have Debra as their first name. Debra is not a native United States and Debra may be came from another language or is a short form of some other name. 0.154238% of people in US have this given name. Expression number of Debra is 3. Debra are lively, imaginative, enthusiastic and optimistic. Debra are expressive and inspire others wherever they go. Debra possess great verbal skills which make them good comedian, artist or writer. Debra Flintoff-King Debra "Debbie" Flintoff-King - Australian athlete specializing in the 400 meters hurdles that was Olympic champion in the Games of SeÃºl 1988. Get the meaning of Debra and celebrities who also shares the same name and some names related to Debra, english baby names list, list of names in english. Know what does Debra mean? This website serves as the extended english names list which will help in naming your child.